For the surrounding metropolitan area, see Northwest Arkansas. For the city of a similar name, see Benton, Arkansas. The area now known as Bentonville's first known use by humans was as hunting grounds by the Osage Nation who lived in Missouri. The Osage would leave their settlements to hunt in present-day Benton County for months at a time before returning to their families. White settlers first inhabited the area around 1837 and named their settlement "Osage". By this time, the Osage had ceased using the area for hunting, and the white settlers began to establish farms. Upon establishment of Benton County on September 30, 1836, Osage was deemed a suitable site for the county seat, and the town square was established as the home of county government the following year. Osage was renamed Bentonville in honor of Thomas Hart Benton, a senator from Missouri who strongly supported Arkansas statehood. The Terry Block Building is the southwest corner of the Bentonville Town Square. Built in 1888, the building now houses the Walmart Museum, adjacent to the original Walton's Five and Dime. After the war, the area established a vibrant apple industry, with Benton County becoming the leading apple producing county in the nation in 1901. In the 1920s and 1930s the county developed a reputation as a leader in poultry production that continued into the World War II years, and which the area still maintains today. The post war economy helped Bentonville grow, with many new businesses starting. In 1950, Sam Walton bought the Harrison Variety Store on the Bentonville town square. He fully remodeled the building and opened "Walton’s 5 and 10 Variety Store" on March 18, 1951. This single store eventually led to the creation of Walmart, the world's largest retailer, which still strongly influences the community today. The late twentieth and early twenty-first century has seen a dramatic reduction in the manufacturing sector in Bentonville, corresponding with an increase in tourism and entertainment focused on the natural setting and outdoor opportunities of the area as well as the Crystal Bridges Museum of American Art, which opened in 2011. This has resulted in Bentonville being the fastest growing city in Arkansas, and the larger Northwest Arkansas area one of the fastest growing in the United States. The Northwest Arkansas region consists of three Arkansas counties: Benton, Madison, and Washington. The area had a population of 347,045 at the 2000 census which had increased to 463,204 by the 2010 Census (an increase of 33.47 percent). The Metropolitan Statistical Area does not consist of the usual principal-city-with-suburbs morphology; instead Bentonville is bordered to the east by Rogers, the north by Bella Vista, and the west by Centerton. The Northwest Arkansas Regional Airport is located to the southwest of Bentonville and is used to connect all of the northwest Arkansas region to the rest of the nation. For more than the last decade, Northwest Arkansas has been one of the fastest-growing regions in the United States. As of 2017 Bentonville had a population of 49,298. The racial and ethnic composition of the population was 77.0% non-Hispanic white, 2.4% non-Hispanic black, 1.2% Native American, 5.8% Asian, 0.2% Pacific Islander, 3.9% from some other race and 2.5% from two or more races. 8.7% of the population was Hispanic or Latino of any race. In the city, the population was spread out with 29.5% under the age of 18, 9.8% from 18 to 24, 34.2% from 25 to 44, 17.9% from 45 to 64, and 8.5% who were 65 years of age or older. The median age was 31 years. For every 100 females, there were 93.6 males. For every 100 females age 18 and over, there were 91.3 males. 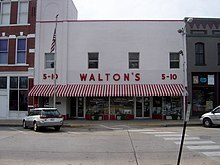 Bentonville has been home to Walmart since Sam Walton purchased a store on the town square in 1950 and renamed it Walton's 5 & 10. The retailer continued a rapid growth, but Helen Walton wished to remain in Bentonville to raise the family, and thus by the time Walmart became the #1 Fortune 500 in 2002, it was still based in Bentonville. The Walmart "Home Office" now includes more than 20 buildings throughout Bentonville, specifically along Walton Boulevard (US 71B) in the western part of the city. In 2017 Walmart announced their intention to construct a new central headquarters in Bentonville, consolidating many of their employees to a more centralized campus. Bentonville is home to a growing entrepreneurial scene, with co-working spaces and startup incubators being added quickly over the last 5 years. Bentonville was ranked as one of the best cities for entrepreneurs in America in 2017 by Livability. Bentonville shares many of the characteristics commonly given to Arkansas as a Southern state, yet it has also absorbed minor cultural influence from the Midwest and West. Located firmly in the Mid-South, Bentonville's culture is distinct and differs from the Delta portion of the state. Many of the city's first settlers came from North Georgia, North Alabama, Kentucky, North Carolina and Tennessee, because they found the Ozarks familiar to the Appalachian Mountains back home. The uplands of Arkansas, including Northwest Arkansas, did not participate in large-scale plantation farming with slaves like the Arkansas delta, instead electing to settle in small clusters, relying largely on subsistence agriculture and hunting rather than the settlement patterns common in the Midwest and Deep South. The "hillbilly" stereotype given to the Ozarks and Appalachians is largely a derivative of the difficult topography, tendency to settle in clusters, and mostly cashless self-sustaining economy found in those regions. Bentonville's large proportion of Southern Baptist and Methodist adherents does however reflect a trend often associated with the Deep South. Due to Walmart's prominence in the city, Bentonville is also an international focal point for retail suppliers and other supporting businesses. According to the Bentonville-Bella Vista Chamber of Commerce, over 1,250 suppliers have offices in Northwest Arkansas in an attempt to secure or retain Walmart's business. Symbolic of Bentonville's complex culture was a cricket game played between PepsiCo and Walmart, spectated by their respective chief executives Indra Nooyi and Doug McMillon, chronicled in a Wall Street Journal article describing the complex Bentonville culture. The game was played on a baseball field in Bentonville not well suited for typical cricket, so the players adapted new rules. The city has a league with 18 teams and a host of fans, mostly derived from the thousands of Indian natives drawn to Bentonville by Walmart software and IT jobs. In late 2018 plans for a public cricket pitch were approved for a new park in the southwest of the city. From the Walmart Museum on the downtown square to the over 20 buildings spread throughout the city, Walmart's Home Office has a presence throughout Bentonville. The Northwest Arkansas Regional Airport has direct commercial flights from many large destination cities not typical of airports its size due to the supplier community. Bentonville, and the recently opened Bentonville West (located in Centerton) High Schools, have programs to assist the sizable transient student population, including international students, for those who have recently relocated to the area. Crystal Bridges Museum of American Art is a $450,000,000 museum of American Art designed by architect Moshe Safdie located within walking distance of downtown Bentonville. The museum was founded by Alice Walton in 2011 and contains many masterpieces from all eras of American art, including many works from Walton's private collection. Walmart Museum: Located adjacent to Sam Walton's original Walton's Five and Dime which serves as a visitor's center. Museum of Native American History: Museum showcasing Native American history, art, and culture. 21C Museum Hotel: Public museum and hotel featuring works of the 21st Century. Beginning in 2015, the Bentonville Film Festival has been held annually the first week of May in Downtown Bentonville. Over 85,000 attendees take part in this week-long event. In 2012 Southern Living Magazine reference Bentonville as the south's "Next Cultural Mecca" given the growth of Crystal Bridges and the surrounding arts and culinary communities. Bentonville is well regarded as a mountain biking destination, earning a Silver Ride Center designation from the International Mountain Bicycling Association  and hosting multiple cycling events throughout the year. Outside Magazine listed Bentonville as one of its best towns of 2017, especially noting the city's bicycle trails and art scene. Bentonville has been recognized as a Bicycle Friendly Community by the League of American Bicyclists since 2012. Citizen input is welcomed through the use of various specialized groups. Although some positions are appointed by the mayor, many consist of volunteers. Requirements include the applicant is a resident of Bentonville and submission of an application in order to gain access to any of Bentonville's 8 city boards. These range from appointed positions at the Planning Commission to the Bentonville Public Art Advisory Committee to the Bentonville Library Advisory Board. The Bentonville District Court handles criminal, civil, small claims, and traffic matters within the city limits. In addition, the Court handles Civil and Small Claims cases when there is proper jurisdiction. The current elected District Judge presides over all cases. Ray Bunch is the current Bentonville District Court Judge. The 19th Judicial Circuit Court covers Benton County as a whole and operates out of the Benton County Courthouse in Downtown Bentonville with Bentonville serving as the County Seat. The current mayor is Stephanie Orman, first elected in 2018. Prior to becoming mayor, Orman served as a member of the City Council as well as serving in and leading several non-profit organizations. The current state representatives that serve districts containing portions of Bentonville are Rep. Jim Dotson, Rep. Rebecca Petty, Rep Kim Hendren, and Rep. Dan Douglas. The current state senator that serves the district containing Bentonville is Sen. Bart Hester. Haas Hall Academy and Northwest Arkansas Classical Academy are the two public charter schools. The Thaden School opened in 2017 and is the first independent high school in the city. The Bentonville Municipal Airport and Louise M. Thaden Field is owned by the city and serves general aviation. The nearest airport for commercial flights is Northwest Arkansas Regional Airport (XNA), located approximately 12 miles southwest of the city center, which opened in 1998. ^ "United States Census Data". www.census.gov. US Census Bureau. Retrieved 2017-05-25. ^ Schaefer, Steve (May 22, 2012). "With Wal-Mart At 10-Year Highs, Some Shareholders Want Directors Shown The Door". Forbes. Retrieved May 31, 2012. ^ a b "Geographic Identifiers: 2010 Demographic Profile Data (G001): Bentonville city, Arkansas". U.S. Census Bureau, American Factfinder. Retrieved September 20, 2013. ^ Bureau, U.S. Census. "American FactFinder - Results". factfinder.census.gov. Retrieved 2018-05-28. ^ "Benton County Fun Facts". Archived from the original on June 25, 2012. Retrieved May 31, 2012. ^ "Community history from Bentonville-Bella Vista Chamber of Commerce". Archived from the original on July 18, 2011. Retrieved August 5, 2011. ^ "Bentonville (Benton County) – Encyclopedia of Arkansas". www.encyclopediaofarkansas.net. Retrieved 2018-05-06. ^ Caprariello, Alex (2017-06-02). "Bentonville Fastest Growing City in NWA". NWAHOMEPAGE. Retrieved 2018-05-06. ^ a b "Northwest Arkansas leads growth in state, 14th fastest-growing metro area nationwide – Talk Business & Politics". Talk Business & Politics. 2018-03-22. Retrieved 2018-05-06. ^ "Monthly Averages for Bentonville, AR" (Table). The Weather Channel. Retrieved May 31, 2012. ^ "Bentonville, Arkansas Climatology" (Table). National Oceanic and Atmospheric Administration. ^ "Bentonville's Largest Employers". Bentonville-Bella Vista Chamber of Commerce. 2014. Archived from the original on March 16, 2014. Retrieved March 15, 2014. ^ Thomas, Lauren (2017-09-15). "Wal-Mart plans for new home office in Bentonville to help lure 'high-quality talent'". CNBC. Retrieved 2018-05-04. ^ Hopper, Laura J. (October 2004). "Bentonville, Ark., Is Sam's Town". The Regional Economist. Federal Reserve Bank of St. Louis. Retrieved March 15, 2014. ^ Disbrowe, Paula (October 6, 2012). "Is Bentonville The South's Next Cultural Mecca?". Southern Living. Retrieved September 14, 2014. ^ "Co-working space opens in Bentonville to support entrepreneurs and startups in NWA – Talk Business & Politics". Talk Business & Politics. 2017-05-12. Retrieved 2018-05-15. ^ "The 50 best small and mid-size cities for entrepreneurs". americancityandcounty.com. Retrieved 2018-05-15. ^ Lancaster, Guy (June 7, 2013). "Arkansas's Regional Identity". Retrieved August 18, 2013. ^ "Wal-Mart influences continue to push rapid growth in Bentonville". The City Wire. March 19, 2014. Retrieved November 29, 2015. ^ Nassauer, Sarah (December 8, 2015). "In Bentonville, Is It Cricket To Play on a Baseball Field? Players face a sticky wicket with 18 teams, no grounds; Wal-Mart vs. Pepsi". Wall Street Journal. p. A1, A12. Retrieved December 24, 2015. ^ "Transportation". NWA Council. Retrieved November 29, 2015. ^ Vogel, Carol (June 16, 2011). "A Billionaire's Eye for Art Shapes Her Singular Museum". The New York Times. Retrieved May 31, 2012. ^ "Crystal Bridges Museum of American Art Announces Director and Plans for New Arts Venue | Crystal Bridges Museum of American Art". Crystal Bridges Museum of American Art. 2017-08-30. Retrieved 2018-05-04. ^ "BFF Announces Continued Growth & 2019 Dates! - Bentonville Film Festival". bentonvillefilmfestival.com. Retrieved 2018-05-31. ^ "Is Bentonville The South's Next Cultural Mecca?". Southern Living. Retrieved 2018-05-15. ^ "Bella Vista Lake". City of Bentonville. Retrieved December 6, 2014. ^ "Memorial Park". City of Bentonville. Retrieved December 6, 2014. ^ "Merchants Baseball Park". City of Bentonville. Retrieved December 6, 2014. ^ "Park Springs Park". City of Bentonville. Retrieved December 6, 2014. ^ "Trails". Crystal Bridges Museum of American Art. Retrieved December 6, 2014. ^ "Ride Centers | IMBA". imba.com. Retrieved 2018-04-26. ^ "bike-bentonville". www.visitbentonville.com. Retrieved 2018-04-26. ^ Michelson, Jacob Baynham and Megan (2017-06-15). "The 25 Best Towns of 2017". Outside Online. Retrieved 2018-05-15. ^ Szczepanski, Carolyn (2012-10-23). "Walmart Helps to Boost Bentonville to BFC Status". League of American Bicyclists. Retrieved 2018-05-15. ^ "Form of Government". City of Bentonville. Retrieved January 9, 2016. ^ "Bentonville, Arkansas City Council". City of Bentonville. Retrieved January 9, 2016. ^ "Boards & Commissions | Bentonville, AR". bentonvillear.com. Retrieved 2018-05-15. ^ Ramsey, David. "Stephanie Orman elected mayor of Bentonville, topping Walton-backed candidate and fending off dark money from D.C. Republican group". Arkansas Times. Retrieved 2018-12-28. ^ "Thaden School | Thaden School". www.thadenschool.org. Retrieved 2018-04-26. ^ Pruna, Jocelyne (November 3, 2012). "Election Day Will Decide Two Positions for Beaver Water District". KFSM-TV. Retrieved January 13, 2013. ^ "Production Data" (PDF). Beaver Water District. October 2015. Archived from the original (PDF) on 2015-12-08. Retrieved November 29, 2015. ^ "About Wal-Mart CEO Doug McMillon". CNBC. Associated Press. 26 February 2015. Retrieved 28 February 2015. ^ "Dwight Crandall Tosh". intelius.com. Retrieved April 3, 2015. ^ "The World's Billionaires 2018". Forbes. Retrieved 2018-05-28. ^ "#20 Jim Walton". Forbes. Wikimedia Commons has media related to Bentonville, Arkansas.